SAN JUAN, Puerto Rico — A former military officer was appointed Wednesday to oversee reconstruction of Puerto Rico's hurricane-flattened electrical grid after a $300 million contract awarded to a small Montana company set off a Twitter feud between the company and the mayor of San Juan. The federal control board that oversees Puerto Rico's finances said retired Air Force Col. Noel Zamot would be responsible for speeding reconstruction efforts and overseeing coordination with the board, Puerto Rico's government and the federal government. 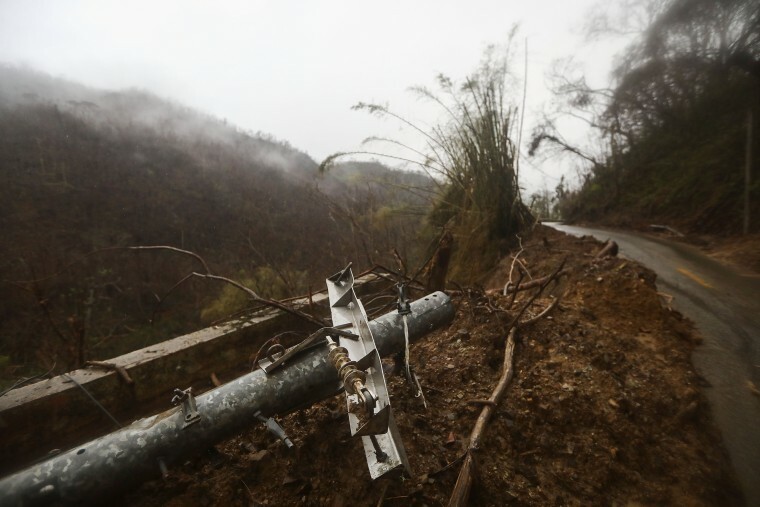 The announcement comes as 75 percent of the U.S. territory remains without power more than a month after it was hit by the Category 4 storm. It's unclear how much Zamot will be paid or by whom as Puerto Rico enters its 11th year of recession and struggles to restructure part of its $73 billion public debt load. A spokesman for the federal control board didn't return a message for comment. Zamot's appointment comes as members of Congress from both parties demand an investigation into the contract awarded to Whitefish Energy Holdings, a small company in Whitefish, Montana, the hometown of Interior Secretary Ryan Zinke. Scrutiny over the contract led to a Twitter spat Wednesday between San Juan Mayor Carmen Yulín Cruz, who said the contract should be voided, and the company, which called her comments "misplaced." Whitefish apologized for its comments Wednesday night, saying they "did not represent who we are and how important this work is to help Puerto Rico's recovery." House Democratic leader Nancy Pelosi of California, meanwhile, praised the federal control board for appointing Zamot, saying additional scrutiny was necessary. "We are deeply concerned both about why and how a small, inexperienced firm was tasked with the massive job of rebuilding Puerto Rico's devastated electrical grid, and why PREPA failed to activate the mutual aid network, which effectively came to the aid of Texas and Florida after the devastation of Hurricanes Harvey and Irma," Pelosi said in a statement. PREPA is the Puerto Rico Electric Power Authority. A Whitefish spokesman has said that the company arrived in Puerto Rico ahead of everyone else and that the director of Puerto Rico's power company, Ricardo Ramos, has praised its work and said the company was the only one that didn't require a down payment. The power company is $9 billion in debt and was already struggling to provide service amid ongoing power outages before hurricanes Irma and Maria hit last month. Whitefish had only two-full time employees when Maria hit Puerto Rico on Sept. 20, but since then it has contracted more than 300 other workers. It was hired before the hurricane hit to help repair the damage the storm was going to leave behind. Puerto Rico Gov. Ricardo Rosselló has said his administration will soon audit the contract awarded to Whitefish, but he rejected Zamot's appointment, saying locally elected officials are still responsible for overseeing government agencies and administration of their funds. Wednesday, he said his administration would ask the Department of Homeland Security's inspector general to conduct its own audit of the deal.